The same chassis was used for both the ISU-122 with the long-barreled 122mm A-19 corps gun and the later ISU-122S which used a new mount similar to that on the SU-100. Overall 1,885 ISU-152 vehicles were built, as well as 1,735 ISU-122 and 675 ISU-122S vehicles which continued postwar. In the early 1950s most of these were rebuilt as ISU-152M vehicles with parts from the IS-3/T-10 heavy tanks. The latest redo and repackaged kit from DML’s affiliate cyber-hobby.com is the ISU-152 heavy self-propelled mount, but as it is a “3-in-1" it also offers the parts for the ISU-122 and ISU-122S in the same box. This time the kit comes with a new lower hull pan (as did the IS-1/IS-2). The kits is, as with the “Orange Series” releases, also bundled into one kit with an older set of figures(No. 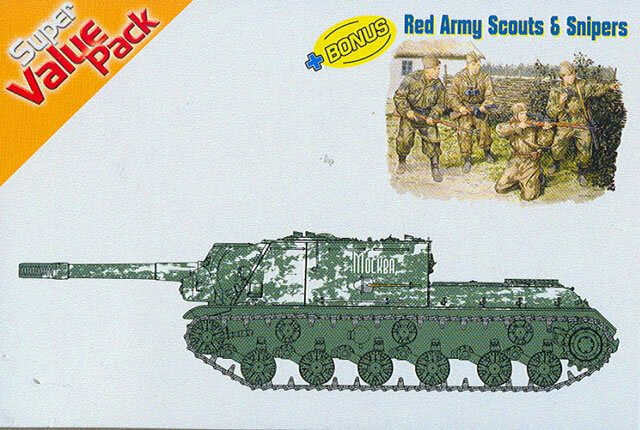 6068, Red Army Scouts & Snipers) and a nice new set of modified IS tracks (“split track” and not “cut tooth”) included from the popular “Magic Track”. As with the IS-1/IS-2 kit, it is likely that some modelers may wish to purchase the kit just for the latter, as they are outstanding and on their own nearly rated this kit a “Highly Recommended”. Note that the “split tracks” come in one piece and are not set up for use Soviet-style as extended tracks – the idea was to fit a regular link and a split link together to give an extended track link every other track for use in snow, mud or marshy ground. Note these are more accurate for the ISU-122 and ISU-152 vehicles. The lower hull pan is lower, but once more the kit comes with the underscale (14.3mm vice the correct 15.3mm diameter) road wheels and other details which have not been brought up to current standards. The only solutions are still (a) live with it, (b) wrap the road wheels with 0.020x0.080" (0.5 x 2 mm) strip, or (c) buy a set of resin road wheels to fix it. The kit does come with the late war option for a 12.7mm DShK AA MG and a nice 13-piece assembly is provided as well. Finishing directions are included for seven vehicles and a large Cartograf sheet accompanies them. For ISU-152s: 384th Heavy SP Artillery Regiment, Czenstochova, Poland 1945 (4BO green with whitewash, “Moskva”); 374th Heavy SP Artillery Regiment, Lvov, Ukraine 1944 (three-color camo over 4BO green, White 45); 3rd Baltic Front, 1945, White 25, Smert’ Nemetskim Okkupantom!” [Death to the German Occupiers! ]; ISU-122, Unidentified Unit, Germany 1945 (whitewash over 4BO green); Unidentified Unit, Gemany 1944 B (brown stripes over 4BO green); ISU-122S, Unidentified Unit, Poland 1945 (partial whitewash over 4BO green, White 16); and Unidentified Unit, Poland 1944 (white front with 4BO green, White 23 “Imeni Mikoyana” [Named for Mikoyan”]). Overall, this is a good combo for a reasonable price and unless one is a real stickler will built up to look the part of an ISU. While a new-mold kit is coming from Tamiya with their excellent lower hull, this kit will get you most of the way there and with its options and figures is a better deal for the budget conscious modeler.